Recently, a friend brought a bag of soaked nuts over for me to try. They were delicious! 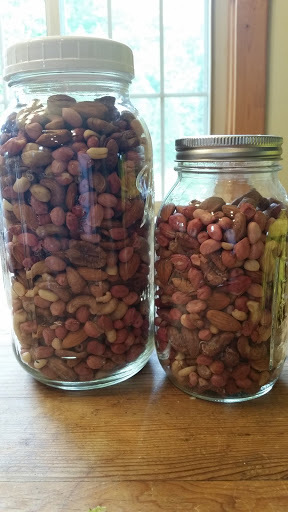 Why soak nuts? What are the health benefits? All nuts (and grains) contain enzyme inhibitors that act as a seed protector until they are needed for germination. However, these enzyme inhibitors interfere with our digestion. The purpose of soaking is to break down the inhibitors so that more digestive enzymes are released. When this occurs our overall gut health is increased and foods of all kinds are more easily digested. Begin with raw, preferably organic, nuts of your choice. I used cashews, almonds, pecans, and peanuts. Add the nuts to a jar filling until about 2/3 full, add salt (I used 1/4 cup to a half gallon jar), and cover with water. Cover with a coffee filter or something similar and secure with a rubber band. Let sit overnight on the kitchen counter. 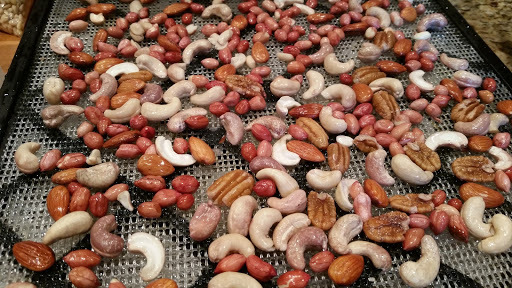 Drain the nuts well and spread in a single layer on your dehydrator trays. Dehydrate at a temperature less than 118 degrees for approximately 24 hours. If you dehydrate at a higher temperature it destroys all the good enzymes that are needed for better digestion. These were dehydrated at 100-105 degrees for 24 hours. To store, place in an airtight jar and keep in your pantry or cabinet. A couple of trusted sources that I read while researching this, differ on their use of salt in soaking nuts. One says that salt is needed in order to break down the enzyme inhibitors while the other says salt is strictly for taste. Since I am a salt-a-holic, this decision was an easy one for me.